He’s part Bo Jackson, part Roy Hobbs and part Superman…but fans have already dubbed him the Cuban Missile (apologies to less-talented but first-anointed Alexei Ramirez of Chicago). Get on this superstar’s bandwagon now with a fun design combining visual elements inspired by the Cuban flag, the Dodgers uniform and his apropos nickname. 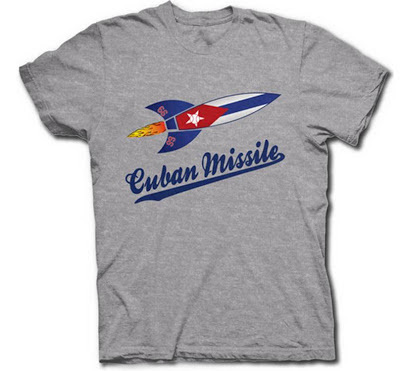 Like all Cubby Tees designs, it is not an official product of any player, league, franchise or revolutionary communist manifesto -- it's just a comical piece of unique art from our imagination; drawn by hand and rendered digitally as a lossless high-resolution vector graphic for perfect printing. It's available on gravel, sport grey or Dodger Blue pre-shrunk cotton tees in sizes small through 5XL. (Alternate cuts/colors/sizes may be available on request). I may have to get me one of these!